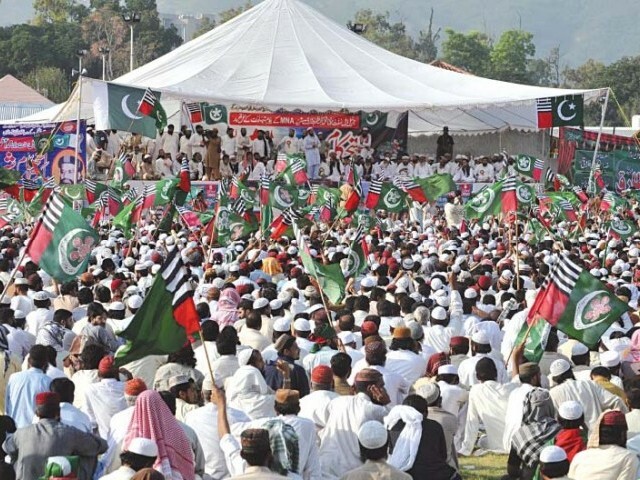 ISLAMABAD — A large crowd of Islamic militants rallied this week in the heart of Islamabad to voice support for Pakistan’s army and to condemn the United States in another sign of a growing tide of extremism sweeping the country. The Thursday rally by Sipah-e-Sahaba Pakistan, a violent group considered close to al Qaida that has been banned by Pakistani authorities, was followed Friday by protests in several Pakistani cities against the death sentence handed down a week ago to an extremist who earlier this year gunned down a senior Pakistani official whom he’d accused of blasphemy. The new evidence of rising Islamic extremism comes as the United States and Afghanistan accuse Pakistan’s military and its main spy agency of supporting jihadist groups — even as extremist violence besieges Pakistan. Pakistani police patrolled Thursday’s rally, which was held in a field hockey stadium and attended by between 5,000 and 10,000 people, according to witnesses, but made no effort to break it up. The group was using its new name, Ahle Sunnat wal Jamaat, but did little to hide its true identity, plastering the stadium with Sipah-e-Sahaba posters while speakers paid homage to the group’s former leaders. Addressing the gathering, Ahmed Ludhianvi, who’s considered the head of Sipah-e-Sahaba, pledged to back Pakistan’s military and its chief, Gen. Ashfaq Kayani. “Because of threats from America and conspiracies against Pakistan, I promise to give Gen. Ashfaq Kayani 100,000 of our followers as fighters,” he said. The event was held in the Aabpara commercial district in central Islamabad, just about half a mile from the headquarters of the country’s Inter-Services Intelligence Directorate spy agency. Last month, Adm. Mike Mullen, the outgoing chairman of the U.S. Joint Chiefs of Staff, claimed that a deadly Afghan insurgent group, the Haqqani network, was a “veritable arm” of the ISI, which is part of the military. Pakistan vehemently denies patronizing Haqqani or other jihadist groups. Separately, after the weekly prayers Friday, demonstrations were held in several cities, including Rawalpindi, where Pakistan’s military is headquartered, and Lahore, against the death sentence handed down by a court last weekend to Mumtaz Qadri, a police commando who in January shot dead Salman Taseer, who was governor of Punjab province. Taseer had spoken out against the country’s blasphemy law, which has been used to prosecute Christians and members of other religions for alleged insults to Islam. An angry mob of several hundred congregated in Rawalpindi, Qadri’s hometown, next to Islamabad, throwing rocks and blocking a major road. In Lahore, the provincial capital of Punjab, about 2,000 people chanting slogans gathered in the center of the city. Hundreds of activists of Ahle Sunnat wal Jama’at, a new face of the banned extremist sectarian outfit, Sipah-e-Sahaba Pakistan (SSP), on Thursday held the oldest and one of the busiest business districts of the capital city hostage for an entire day. In a hustle to accommodate the participants of the rally, who had come to commemorate the death anniversary of their slain leader, Maulana Azam Tariq who was gunned down on the outskirts of the capital in 2003, the panic-stricken administration blocked all the roads leading to Aabpara and even the nearby streets. The rally was held at the Aabpara Community Centre near the commercial hub where thousands of residents from the twin cities come for their businesses, jobs and shopping. The area around the venue of the rally was cordoned off by erecting makeshift fences and jersey barriers diverting traffic to narrow lanes and streets in G-6. It appeared the administration catered too well to the needs and security of the participants of the rally and forgot the residents and the commuters. Multiple entry and exit routes, guarded by police officials and walk-through gates were provided to the participants of the convention. However, a shrine nearby and its people, were left unguarded. Some of the participants of the rally chanted slogans at the shrine while passing by it on their way back. The administration did not open the roads and streets until the last of the participants left the venue and the nearby Aabpara Market. In the morning people found it very difficult to reach their offices on time as all the traffic was badly disturbed and the ordeal continued throughout the day. “Life has become very difficult for the common man in Pakistan. Every morning we wake up with a new obstacle to overcome, with a new challenge, there is always a worry whether we’ll be able to make it to our destination or not,” said Tariq Shah, a passerby while talking to The Express Tribune. A family that had come from Azad Kashmir to meet their relatives, who live near Aabpara, faced a lot of difficulty to reach there. “We were asked to park our car on Kashmir Highway by the police. I was forced to get a wheelchair for my old mother, so that she could be cross the road,” said Kamran. Sanaullah, a corn vendor, struggled to make a single sale. “My house runs on my daily earning, I won’t be able to provide for them today I guess,” he said. Shafiq, a shopkeeper had similar worries as no one had visited his shop since morning. “Load shedding and sky rocketing inflation have already rattled our businesses and now such events are making it worst,” he said. “When I arrived in the morning I saw these hurdles (pointing to concrete blocks) and the road to my office was blocked,” said Muhammad Mustafa who had to park his car several kilometers away from his office situated on the Khayaban-e-Suharwardy, the road on which main Aabpara is located. Mustafa was one of many such commuters who had to park their cars at the traffic junction adjacent to 7th Avenue as the police had blocked the main road with concrete blocks and the link road with moveable barriers. “I have taken three circles of this area. Every street leading to my office place was blocked. Now he (the constable) is asking me go the same way back while my office is just there in front of me,” said Muhammad Hasnat pointing towards his office across the barrier. People complained they were not informed of the blockade of routes and the security arrangements through media or any other means either by the police or the city administration. “I was surprised to see my way blocked in the morning. I got late from office and remained worried for my car the whole day,” said Tabassum, who had to leave his car along one of the blocked roads. He and his colleagues had to travel by foot from one end to the other end of the Aabpara market to get to their office.